We "Bharat Tent Manufacturers" are expanding our wings across the country by manufacturing and exporting a wide assortment of Shamiana Tent, Sidewall Tent, Wedding Tent Jhalar, Wedding Entry Gate, etc. Under the enthusiastic guidance of our Owner, "Nawab Khan", we have been able to fulfill varied requirements of various industries. Incepted in the year 1998 at Jaipur (Rajasthan, India), we are supported by advanced infrastructural base that enable our team members to manufacture qualitative range of accessories and decorative products as per the global set norms. This unit is outfitted with all the requisite amenities. Our infrastructural base comprises of well functional sub-units like procurement, quality testing, sales, R&D, admin, production, warehousing, transportation, packaging, etc. All these sub-units are managed by our skilled and experienced team members. To keep these accessories and decorative products in an organized manner, we have also established a capacious and well equipped warehouse. We assure our clients that these accessories and decorative products are manufactured in adherence to international quality standards from well tested raw material and innovative technology. Offered products are widely used during the decoration of wedding venues. The offered accessories and decorative products are applauded for their excellent strength, precise design, attractive look, low maintenance and durability. We provide these accessories and decorative products in different specifications in order to achieve the utmost satisfaction of the clients. Our quality controllers meticulously test these accessories and decorative products on defined quality parameters in order to provide defect free range to the clients. Additionally, clients can avail these accessories and decorative products from us at reasonable rates. 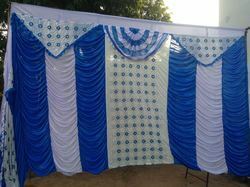 BHARAT TENT MANUFACTURERS, We lay prime focus on the quality of the raw materials and decorative products. The raw materials and the products that we use to make the products are procured from trusworthy vendors and reputated company of the market.We assure our customers that provided products and accessories are also checked and very well tested by us. We have gained trust from our customers so please give us a chance to serve and to prove our quality.